With one fast food joint or franchise every other block, it’s hard to remember a time when there weren’t a lot of them in New York. I had a meal at McDonalds as a kid in upstate New York in the 1960s, but it wasn’t until 1975 or so that I actually ate at a McDonalds in the five boroughs. That one was at 37th Street and 4th Avenue in Sunset Park, and that one is still there. At Sheepshead Bay Road and West 6th street in Brooklyn, there’s a standard Mickey franchise, but with a slight difference: they employ the little guy with the chef hat and striped pants logo, which was used in early McDonald’s stores in the midwest in the 1950s. Note here’s only one golden arch instead of the usual two, though the double arch can also be seen here as well. I grew up in Warbasse, so that was my home base Mickey D’s. There aren’t too many McDonalds that still use the old design. I have been to this one a few years ago. I think I saw another one somewhere in New Jersey, but I don’t remember where. It’s nice to see some that still use this design when many have changed over the years to what they are now. On a side note, the one near me didn’t originally have a drive through or a Play Place until after it went a rennovation, and only later one got the machine for giving drinks to the customers that would allow for free refills. Same thing with this one about the play pen and the drive through. In fact, when they first put the drive thru in, the window to pay and get food was on the passenger side of the car, so if you were by yourself, that had an extenion tray they’d pass through the passenger window across the car to the drvier’s side to collect money, give you your food, and give change. The food got to the drive thru attendant via conveyor belt near the ceiling from the counter to the drive thru window, as it was built across the place from the kitchen. They’ve since reconfigured it so everything is now on the left, as it should be. The playpen was initially indoors, but that was removed and now there is a small play area, and al fresco tables, outside. 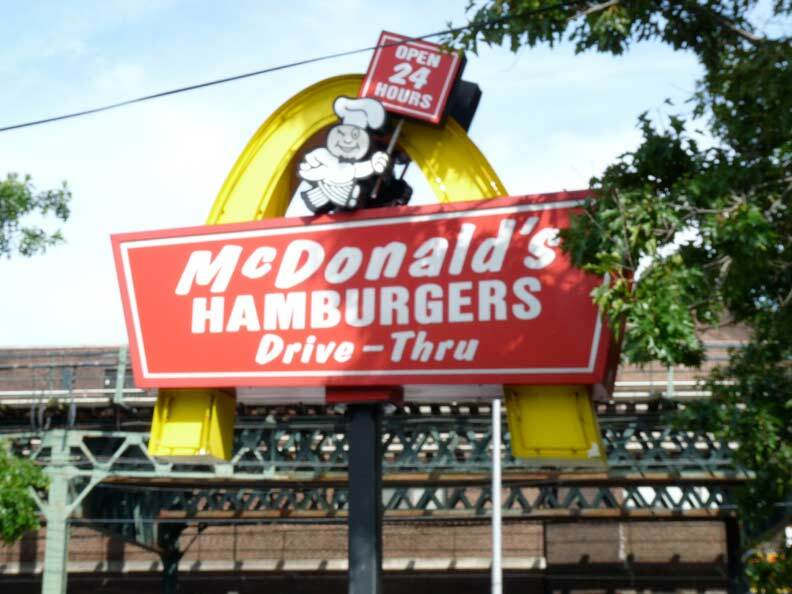 One of the first McD’s in the city was in Brooklyn on Clarendon Road & East 58 Street. It opened in 1971 and was a box-style building, no arches overhead. The very first McD in NYC may have been the one on Nostrand Avenue & Avenue X or Y. It had the double arches over the structure. First Burger King in Brooklyn was somewhere on 86 Street near Bay Parkway, followed by a larger one on Flatbush Ave & Nostrand Ave which closed after only a few years. Any fast food “historians” out there? Actually, the first McDonald’s restaurants were in southern California, and they also used this guy in the chef’s hat (his name is “Speedee”). The oldest continously operating McDonald’s is in Downey, California (1953), and they still proudly display this guy on their giant sign at the corner of Lakewood Blvd. and Florence Ave.